There are many vulnerable groups in Tanzania who are desperately seeking a way to empower themselves and get out of the vicious cycle often created by poverty. Projects Abroad are targeting specific groups in need of help and will provide funding and training to give them the skills and financial help needed to start a business. This will enable them to secure a sustainable future for themselves through small scale entrepreneurship. This Micro-finance project provides vulnerable individuals or groups with small loans which over time and with guidance they will reimburse. Following complete reimbursement new candidates will then be selected. 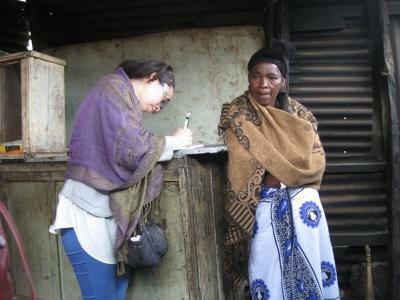 As a volunteer you will work in the Projects Abroad Micro-finance office in Arusha, alongside a dedicated local team helping to ensure that the individuals and groups taking part are given a chance to make a future for themselves. providing general business guidance and support. If there is an area in which you would like to focus in particular please let us know. Recent small businesses that volunteers have been working with include rearing chickens and making and selling jewellery. By joining this project you will gain a unique insight into the process of developing small businesses in a foreign country and how micro-credit can help disadvantaged people find their way out of poverty and become self-supporting and independent. You will spend time in a completely new environment, learning about a different culture and way of life. It will be a rewarding as well as a challenging experience. Following the first year anniversary of this project, the business groups we have been working with completed a feedback survey. The Micro-finance project runs all year round so you can join us at any time. You do not need any prior experience but it is important that you have a keen interest in this area and are flexible, communicate well and are willing to learn. It would also be useful for you to take an additional Swahili language course, either before or during the project so that you become familiar with the local Tanzanian language which is widely spoken in the communities you will be working with.